List of animals in danger of extinction in Indonesia has become longer. Animals (livestock) is a species of rare endangered become extinct or extinct in the wild (extinct in the wild) or fully extinct (extinct). The animals are declared endangered by the relationship between the number of species (populations) and based in the area of dispersal (Habitat). 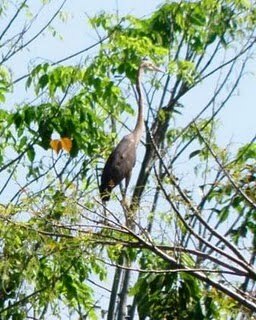 In Indonesia, the more rare animals. These animals become rare and endangered due to changes in natural conditions, predators and also because of hunting by humans. Derivative of the old world deer species Moose are considered as the oldest, has existed since 15-35 million years ago, with the remains of the Miocene are in France and Jerman.Jantannya have short horns which can grow if it is interesting now patah.Hewan molecular evolution of the attention of the researchers, which has a variation of the drama of the number of chromosomes and the discovery of several new species (especially in Indochina). Maluku charred in Eulipoa wallacei scientific name is a species of bird carbonized are small, with a length of about 31 cm, and it is the only species within a single genus Eulipoa. Choral birds Moluccas have fur Brown olive, the skin around the face of pink, Rainbow, Brown, dark legs beak, greyish yellow, the feathers under the dark blue-grey and white upside down. On the back there are motifs in the form of cross and cover an advantage of dark red grey wings. The population of Indonesia is endemic animals found only in the forests of hills and forests of mountain in the islands of the Moluccas and West Papua Island Misool. Charred Moluccas is the only known nesting birds burn in the night. Coral Maluku bird nest is normally found in areas of open sand, the beach around the Volcano area and warm areas of geothermal energy. 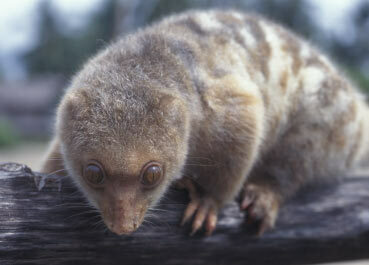 Bear Cuscus or Kuse (Ailurops ursinus) is one of two possum species endemic to Sulawesi. This includes in-class marsupial animals (marsupials), in which women carrying babies in a pouch located in the abdomen. Kuse head and body length 56 cm, 54 cm and weight of the tail can reach 8 kg. Kuse has a tail that prehensil, namely tail that can be held and used to help hold on to time to climb tall trees. Fate Kuse North Sulawesi in danger because populations too small. Between 1980 and 1995 in Tangkoko has been a reduction in density by 50%. During the survey WCS in protected forests of North Sulawesi in 1999, the animal was only seen seven times along the 491 km line transects. This shows the population density is very low. Java Eagle (Spizaetus Schinderhannes) is the national bird because of its resemblance to Garuda Indonesia and also a symbol of wild species in danger of extinction in Indonesia. 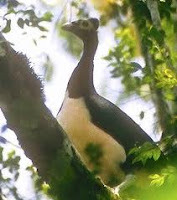 Eagles of Java only exist on the island of Java and its dissemination is limited in these forests. 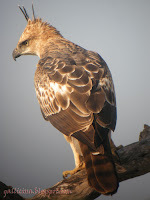 As a top predator, Eagles Java play an important role in maintaining the balance and the role of the forest biome in Java. Java Eagle is one of the rarest birds in the world of the dam. 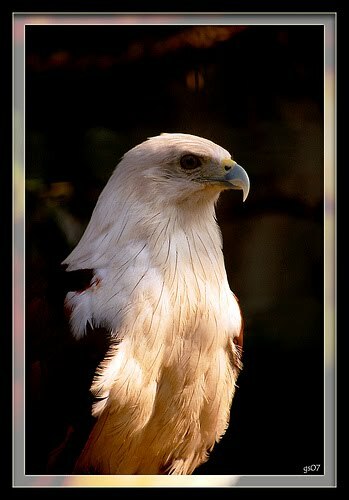 On the basis of the criteria most recent keterancaman of IUCN, Java Eagle included in the endangered category. Blue Peacock (Peacock India) that the scientific name Pavo cristatus is one of three species of peacocks. 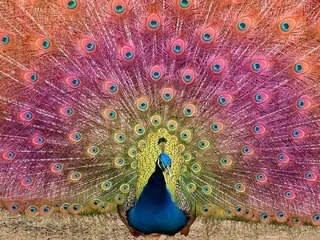 Peacock Blue has a glossy dark blue feathers. 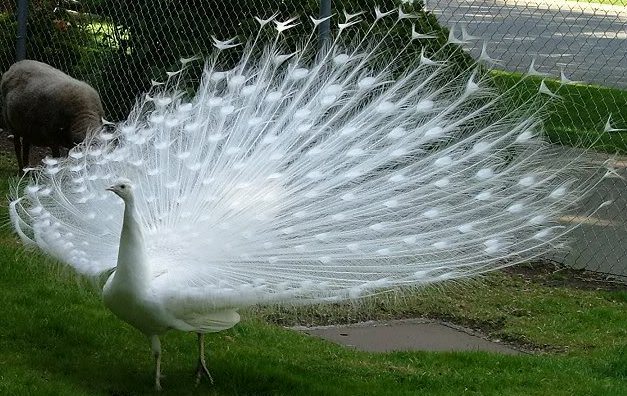 large adult male birds, can reach 230cm and length, with a very long tail cover metallic green. On top of their head vertical blue fan-shaped crest. female bird smaller than males. Feathers are not shiny, greenish brown with black stripes and without feathers adorned the cover tail. Young birds such as women. Included in the Ciconiidae tribe, the Heron Tom-Tom Habitat in Asia, especially the India, Indochina and Indonesia less Irian and the Moluccas. It spread to Africa, Myanmar, Hong Kong and the Philippines. This strong-legged birds like to live in marshes, rivers, mangroves, wetlands and open woodland. Sometimes in the dry land and mud. His body was black, except for the neck and the lower part of the abdomen are white. The length of the body can reach 91 centimeters. At night, the Heron Tom-Tom perched in a tree. Dwarf buffalo (Bubalus spp.) Anoa also called dwarf or forest buffalo cows. 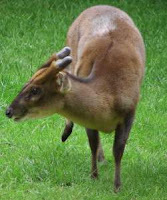 Anoa is the largest land animals in Sulawesi. 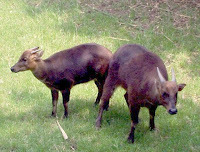 There are two types of Anoa in Sulawesi, namely Bubalus depressicornis (Anoa lowland) and Bubalus quarlesi (Anoa plateau). Anoa food in the form of fruit, tuna leaves, grass, fern, and moss. 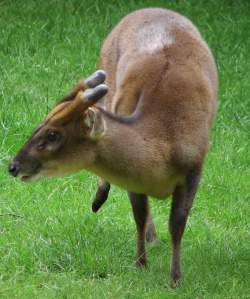 Anoa are solitary, although never encountered in the group. Like other wild animals, known Anoa aggressive and unpredictable behavior. Because only eat buds and fruit trees that do not contain much sodium, then anoa should complement the food with sodium salt to find a place. At this time, the population had fallen sharply Anoa. In the nature reserve Tangkoko Two Brothers Play Bitung Sulawesi, the number Anoa decreased 90% for 15 years and has undergone extinction of this species. These birds include carnivores or meat eaters. One type of popular Kestrel Kestrel is the dragonfly. It was known for his tiny body. 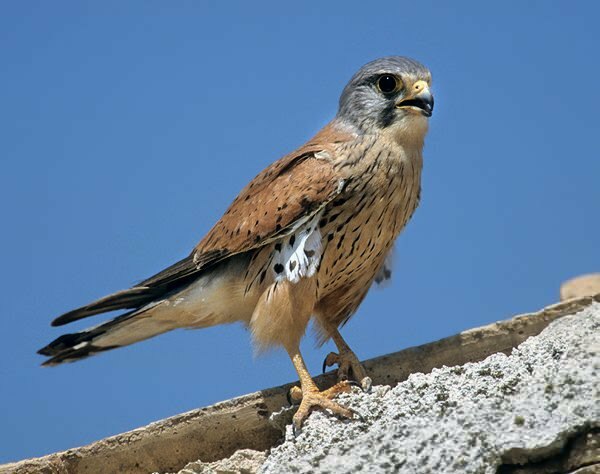 Kestrel small dragonflies beaked bird, warm-blooded, and like birds in general, it multiply by laying eggs. Known as the world's smallest carnivorous birds, dragonflies Kestrel can be found in Southeast Asia with an average size of 15 cm and weighs 35 grams.